Wide receivers Michael Floyd, right, and John Brown of the Arizona Cardinals celebrate after scoring a 42-yard touchdown against the Detroit Lions at the University of Phoenix Stadium on Nov. 16 in Glendale, Arizona. The Cardinals defeated the Lions 14-6. With an 11-3 record, the Arizona Cardinals were the first team in the NFC to clinch a playoff berth and have already tied their franchise record for wins in a season. All this, despite losing their top two quarterbacks, Carson Palmer and Drew Stanton, to injury. With a win Sunday night against the Seattle Seahawks, the Cardinals would clinch the NFC West and home-field advantage throughout the playoffs. But much like the Florida State Seminoles in their run to the College Football Playoff, the Cardinals have eked out wins in a lot of close games. So the question remains, are the Cardinals lucky or good? They’re lucky — Arizona probably isn’t as strong as its record — but also have been one of the most clutch teams in the NFL this season. Let’s begin with the luck. The most unambiguous measure of luck in football is fumble recoveries. They tend to be random acts, and a team with an unusually high fumble recovery rate one year generally regresses to the mean the next. The Cardinals lead the NFL in fumble recovery percentage; they’ve recovered 17 of 27 (63 percent). More generally, Arizona has not controlled games like a team that has won 11 of its first 14 games. The Cardinals have had, on average, a 52 percent chance to win across all of their plays in all of their games this season, which ranks 15th in the NFL. Every other team with at least 10 wins ranks in the top 10 in average win probability. A team with an average win probability around 50 percent would be expected to win about half of its games. Similarly, a team with a scoring margin of +43 — as the Cardinals have through 14 games — would be expected to win about eight games. 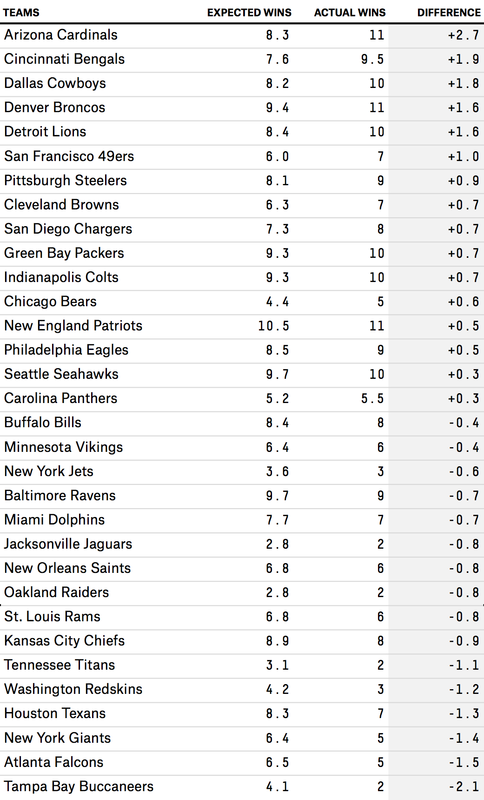 Pythagorean expectations, which were first popularized by baseball’s Bill James and then translated to the NFL, can be used to estimate how many games a team “should” win based on its points scored and points allowed. By this measure, the Cardinals have 2.7 more wins than would be expected. That is the biggest difference between expected wins and actual wins in the NFL and the largest by a team since the Colts went 11-5 in the 2012 season with a negative scoring margin. A higher-than-expected win total suggests a team is winning close games, which is exactly what Arizona is doing. The Cardinals are 5-0 in games decided by eight points or fewer, the best winning percentage and tied for the most wins in the NFL. Arizona has an NFL-high four wins in which they trailed entering the fourth quarter. Winning close games, however, is not purely luck. The Cardinals have an uncanny ability to perform their best with the game on the line. They lead the NFL in points allowed (43), points margin (+59) and turnover margin (+12) in the fourth quarter. And a metric called win probability added, which looks at a team’s contributions to winning (accounting for late, close-game situations), has them atop the NFL when adding their offensive, defensive and special teams WPA. A mixture of luck and clutch plays have the Cardinals one win away from home-field advantage throughout the playoffs. With a 7-0 record at home, who knows what will happen once the playoffs begin, as the Cardinals look to complete one of the most improbable runs in NFL history.